The first recorded dinosaur remains found consisted of a few teeth and bones discovered in 1822 in Sussex, England, by an English doctor, Gideon Mantell. He named them Iguanodon or “iguana tooth.” Not long after this first find, other fossil teeth and bones were found near Oxford, England, by Rev. William Buckland. These were named Megalosaurus (“great lizard”). Early reconstructions of the Iguanodon look laughable today since those early paleontologists envisioned them merely as big lizards. 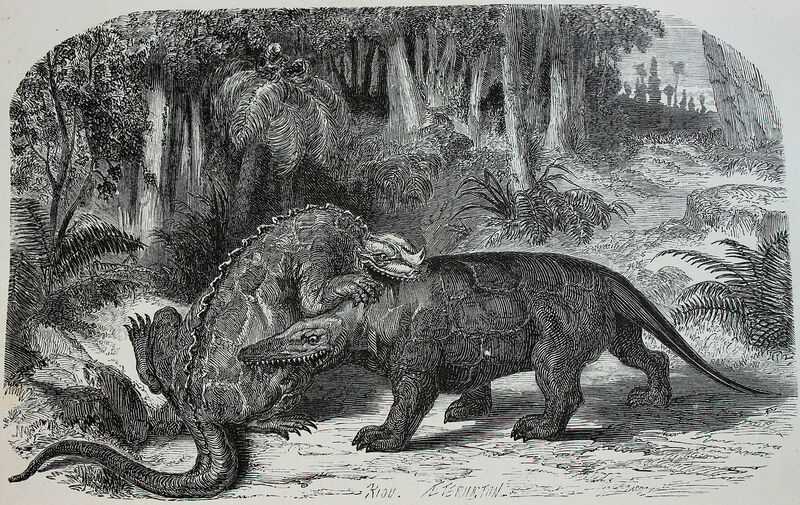 The lumbering, bear-like Megalosaurus was not drawn much better (see the picture from 1863 of the two dinosaurs represented in combat). As Americans found exciting new kinds of dinosaurs in the west, two wealthy professors began a rivalry in the 1870s that has come to be known as “The Great Dinosaur Bone Wars.” Othniel Marsh of Yale University and Edward Cope of Haverford College both fielded fossil-hunting teams, racing desperately to find new fossil beds to name the next dinosaur. 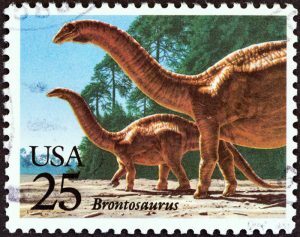 In their hurry to name what appeared to be a large new dinosaur, Marsh’s team placed the wrong head on a specimen and gave it the name “Brontosaurus.” When it became clear that the head belonged to Camarasaurus and that the body was the same as the Apatosaurus skeleton that had been found earlier, the name Brontosaurus was dropped. However, the name continues on in popular usage, as is demonstrated by the 1989 US Postal Service stamp to the left. While the western US continues to be popular ground for paleontologists, thousands of dinosaur specimens have since been discovered all over the world, including Antarctica. Many of the more sensational finds in recent years have come from China. 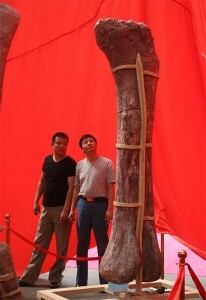 Some villagers in central China’s Henan Province have been digging up tons of dinosaur bones for decades. The fossils were being sold locally as “dragon bones” for the equivalent of 50 cents per kilogram (about 2 pounds). The bones would be ground up into a fine powder to be used in traditional medicines (following the ancient beliefs that the bones of flying dragons had healing powers). Today those excavation sites have caught the interest of paleontologists and the bones are being excavated for display, rather than for soup! A sample of these huge bones can be seen to the right.